In a few days NYC residents will start piling out of their apartments, heading for beaches, mountains and country shindigs for the last long weekend of summer. The Streets will soon be blissfully quiet. On Labor Day you’ll be able to look up and down the Avenues and count the cars on a single hand. Left behind will be luxurious open spaces, subways and buses with plenty of empty seats, restaurants where you can take your pick of the best tables and city folk who relish the city’s rare bucolic rhythms. 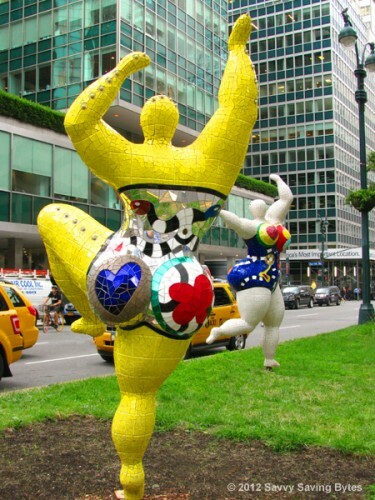 Also left behind will be Niki de Saint Phalle’s joyous Nanas, part of an eight block Park Avenue installation in the Fifties celebrating the artist’s work. Shown here are two of her frolicking, dancing Nanas and a monumental frisky Nana riding a dolphin. See more of her pieces on this Channel One report. Brilliantly colored and bursting with life, her zesty, vibrant works are accessible to a wide global audience. Given the earthy scope and unique, cheeky quality of her vision, it wasn’t surprising to read that she was expelled from the ritzy Brearley School here in the city for painting fig leafs red on various school statues. It’s also worth noting on this Labor Day that she made it to the top of the art world on her own steam. Self-taught, she never received any formal art training. Her striking New York installation may be enjoyed through November. I have only ever been to New York City one time, nearly 30 years ago. I found the foot traffic on the street dizzying to my sensibilities so it would be fun to come visit during a weekend like this. And these statues look like loads of fun. The city’s pace during winter holidays, especially Christmas and Thanksgiving, is especially frenetic. The summer holidays are always quieter, but you have to be lucky not to hit it during a hot humid spell. Though this summer has not been as torrid as much of the country. 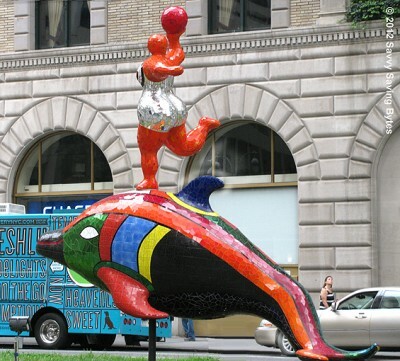 These Park Department art installations are fabulous for everyone – artists, residents, tourists, businesses. They liven up the whole city. The joyous Nanas are wonderful. I miss NYC! It looks like a visit to NYC is shaping up for Jan 2013. I hope you’ll come out and meet us when we’re there, maybe for a drink or something? School started today. It’s fabulous :). Such enthusiasm about school so fast. Great! You lucky school folk with all that vacation time. Would love to meet up with you in January.